H2S Analyzer, SA4000-3 | Lazar Scientific, Inc. 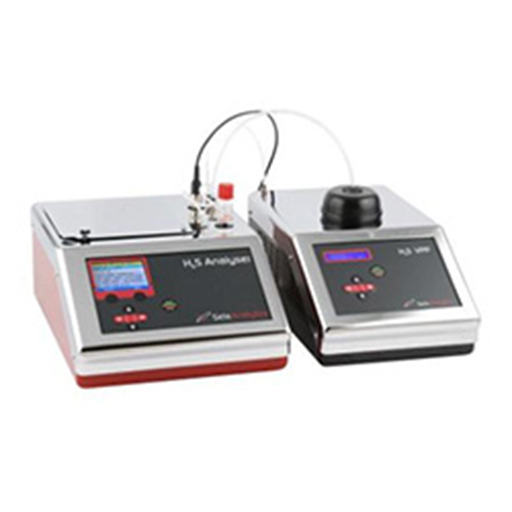 The SA4000-3 H2S Analyser and SA4015-0 Vapor Phase Processor are compact bench-top instruments, used to measure the total hydrogen sulfide ( H2S) content of fuel oils, such as marine residual fuels, distillates, and petroleum blend stocks. The H2S Analyser can measure H2S concentrations from 0 to 250 mg/kg (ppm) in the liquid phase. H2S is efficiently purged from the test sample by a combination of heat and agitation and is measured by a proprietary advanced gas specific detector. The instrument offers a cost-effective solution for H2S measurement – no costly or hazardous chemicals are required and there is no need for analytical preparation by an experienced chemist. The Vapor Phase Processor (VPP) is used with the H2S Analyser and removes components that may affect the accuracy of the results, such as toluene, xylene, thiols (mercaptans) and alkyl sulfides. The VPP accessory is designed to promote the safer use of residual and distillate fuels, recognizing the fact that the industry is entering into a new realm of multi-blend products driven by increasing environmental regulation. The H2S Analyser combined with the VPP offers a fast and robust means of determining H2S levels to ensure effective evaluation and treatment of crude oil. The instrument provides a cost-effective alternative to traditional methods which typically are unable to identify entrained H2S, especially at low gas levels. The SETA H2S PTS scheme provides a global inter-laboratory comparison of test results and performance. Participation acts as a quality assurance programme enabling users to continually monitor and validate instrument performance and results in accordance with ISO/IEC 17025.